From the start we know that the course of true love has not run smooth for elderly, enigmatic Flora Cochrane, née Mackie, dubbed the Snow Queen for her adolescent trips north of the Arctic Circle with her Dundee whaler father and the summers spent on the Greenland coasts, sharing the shoreline with the local Inuit while the whalers killed whales for their profitable oil. Much of the book is spent in the past, with the 1948 publicity flight to the North Pole,which opens the novel providing tantalising foreshadowings of the key events in Flora’s life. We jump back in time to the 1880s to we meet 12 year old Flora Mackie on her first voyage to Greenland. We follow Flora through her University years in London where she studies meteorology and yearns to return north, which she achieves by marriage to a moneyed man and together they launch a British Scientific Expedition to the Arctic. Alongside Flora’s early life, we learn that of New Yorker Jakob de Beyn, a geologist who joins Lester Armitage’s American expedition to reach the North Pole. And so we know that Flora and Jakob will meet, but that their relationship will not last. Great characters, wonderful descriptions of the Arctic’s peoples, ways of life, geography and climate. 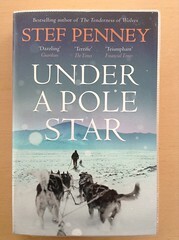 Although fictitious, Under A Pole Star does contain echoes of real people and events, and two in particular stood out for me – Robert Peary and Minik Wallace.